Identification: The genus Hoplosternum was reviewed and revised by Reis (1997), who also provided keys, distinguishing characteristics, and illustrations. A photograph also appeared in Nico et al. (1996). Native Range: Tropical America. Occurs in Trinidad, and is widespread in South America east of the Andes and north of Buenos Aires, including the Rio Orinoco, coastal rivers of the Guianas, Rio Amazonas basin, Rio Paraguay, lower Rio Parana and coastal systems in southern Brazil (Reis 1997). Table 1. States with nonindigenous occurrences, the earliest and latest observations in each state, and the tally and names of HUCs with observations†. Names and dates are hyperlinked to their relevant specimen records. The list of references for all nonindigenous occurrences of Hoplosternum littorale are found here. Ecology: Hoplosternum littorale is typically found in a variety of freshwater habitats, including slow-moving rivers, canals, streams, and pools (Nico et al. 1996; Gestring et al. 2009). This species is a facultative air breather, an adaptation that allows it to colonize and survive in habitats with low dissolved oxygen (Winemiller 1987; Brauner et al. 1995), such as the seasonal wetlands of the Florida peninsula (Kline et al. 2013). This species is a benthic scavenger, primarily consuming benthic microcrustaceans (e.g., cladocerans, ostracods), aquatic insect larvae, detritus, and plant matter (Winemiller 1987; Gestring et al. 2009). Brown hoplos are sexually dimorphic, with males larger than females and possessing enlarged pectoral fin spines and adjacent fat deposits during the reproductive season. These enlarged spines are used in aggressive or defensive encounters (Winemiller 1987; Hostache and Mol 1998). Nico and Muench (2004) describe nesting habits of this species in Florida. Spawning season in Florida occurrs from May to September, coinciding with the rainy season and generally higher water levels and temperatures, and similar to the timing of the reproductive season in the native range (Winemiller 1987). Numbers of bubble nests and gonadosomatal indices (GSI) for both males and females peak in August-September (Nico and Muench 2004; Gestring et al. 2009). Means of Introduction: Unknown. Possibly released food fish, aquarium release, or escape from aquaculture ponds. Expanded range around Florida may have been assisted by humans to establish both commercial and subsistence fisheries (Gestring et al. 2009). Status: Established in Florida (Nico et al. 1996), this species has expanded its range throughout peninsular Florida, as far north as the Jacksonville area in Duval County. Impact of Introduction: Largely unknown. In several Florida water bodies, this species is locally abundant; because it feeds heavily on benthic invertebrates and detritus, the species had negative effects on the benthic invertebrate communities, possibly competing with native fishes when prey are limited (Duxbury et al. 2010). This species utilizes atmospheric oxygen by surfacing to breath, and can tolerate a wide range of environmental conditions (e.g., fresh and brackish waters). There is concern that it will eventually invade many natural freshwater wetlands and coastal marshes in Florida (Nico et al. 1996). Duxbury et al. (2010) found that H. littorale reduced both abundance and diversity of aquatic macroinvertebrates in experimental enclosures. Stevens et al. 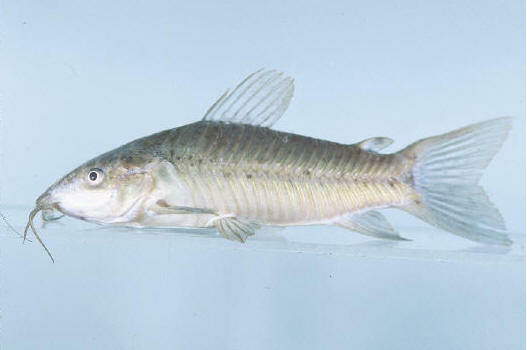 (2010) found that H. littorale was an important part of the diet of Common Snook (Centropomus unidecimalis) in the tidal freshwater portion of the Peace River immediately following Hurricane Charley in 2004. It is also consumed by other large piscivores, including Largemouth Bass (Micropterus salmoides), Butterfly Peacock Bass (Cichla ocellaris), alligators, Double-crested Cormorant (Phalacrocorax auritus), and Great Blue Heron (Ardea herodias) (Gestring et al. 2009). Remarks: A small commercial and recreational castnet fishery for H. littorale has commenced in Florida, which is a popular food fish in its native range. Part of the species' rapid expansion throughout peninsular Florida may have resulted from illegal movement by castnet fishermen to enhance local fisheries (Gestring et al. 2009). The identity of specimens caught in Florida was confirmed by R. Reis. Voucher specimens: FSBC 19134, 19483, 19509, 19514, 19705, 19722, 19760-61, 19841-42; UF 101746-48, 103796, 113315, 118271, 124361, 126665, 126693, 127537, 133208, 136069, 139830, 143223, 143235, 143270, 143511, 143550, 143560, 143786, 143799, 147247, 147323, 147356, 148180, 148626, 163651, 163721, 164139, 169265, 171019, 172851, 173733, 173780, 174466, 174971, 174972, 177080, 177881, 177902, 178791, 179022, 179223; UMMZ 231955; YPM 16437. Brauner, C.J., C.L. Ballantyne, and D.J. Randall. 1995. Air breathing in the armoured catfish (Hoplosternum littorale) as an adaptation to hypoxic, acidic, and hydrogen sulphide rich waters. Canadian Journal of Zoology 73:739–743. Call, C.L. 2003. Exotic catfish invade Myakka River. Venice Gondolier Sun, April 26, 2003. Duxbury, C., J. Holland, and M. Pluchino. 2010. Experimental evaluation of the impacts of the invasive catfish Hoplosternum littorale (Hancock, 1828) on aquatic macroinvertebrates. Aquatic Invasions 5(1): 97-102. Gestring, K.B., P.L. Shafland, M.S. Stanford, and R.L. Eisenhauer. 2009. Status and selected life history attributes of the illegally introduced brown hoplo (Hoplosternum littorale) in Florida. Florida Scientist 72:37-47. Hostache, G., and J.H. Mol. 1998. Reproductive biology of the neotropical armoured catfish Hoplosternum littorale (Siluriformes - Callichthyidae): a synthesis stressing the role of the floating bubble nest. Aquatic Living Resources 11(3):173-185. http://dx.doi.org/10.1016/S0990-7440(98)80114-9. Kline, J.L., W.F. Loftus, K. Kotun, J.C. Trexler, J.S. Rehage, J.J. Lorenz, and M. Robinson. 2013. Recent fish introductions into Everglades National Park: an unforeseen consequence of water-management? Wetlands. http://link.springer.com/article/10.1007/s13157-012-0362-0. Lohrer, F.E. 2005. Fishes of Buck Island Ranch, Lake Placid, Florida: A preliminary checklist. http://www.maerc.org/html/datapublications/biota_splist/fishes.html. Created on 02/10/2005. Accessed on 05/01/2013. Nico, L.G., S.J. Walsh, and R.H. Robins. 1996. An introduced population of the South American callichthyid catfish Hoplosternum littorale in the Indian River Lagoon system, Florida. Florida Scientist 59(3):189-200. Nico, L.G. and A.M. Muench. 2004. Nests and nest habitats of the invasive catfish Hoplosternum littorale in Lake Tohopekaliga, Florida: a novel association with non-native Hydrilla verticillata. Southeastern Naturalist 3(3):451-466. Reis, R E. 1997. Revision of the neotropical catfish genus Hoplosternum (Ostariophysi: Siluriformes: Callichthyidae), with the description of two new genera and three new species. Ichthyological Exploration of Freshwaters 7:299–326. Stevens, P.W., D.A. Blewett, T.R. Champeau, and C.J. Stafford. 2010. Posthurricane recovery of riverine fauna reflected in the diet of an apex predator. Estuaries and Coasts 33:59-66. Winemiller, K.O. 1987. Feeding and reproductive biology of the currito, Hoplosternum littorale, in the Venezuelan llanos with comments on the possible function of the enlarged male pectoral spines. Environmental Biology of Fishes 20(3):216-227. http://link.springer.com/article/10.1007/BF00004956.